This example was discovered in a thatch in Eckington, Worcestershire. 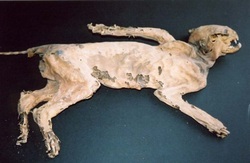 There are well over a hundred dried, or mummified, cats on record at present - although there are anecdotal records for probably over ten times that amount. The most common places to find these poor creatures is in walls, under floors and sometimes in roof spaces. 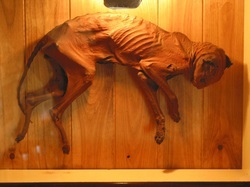 This cat is on display in the bar at the Red Cat Hotel in Norfolk - published here by kind permission of the owner. Folklore tells us that cats were regarded as being particularly gifted with a sixth sense. Perhaps it was hoped that the family cat, who served so well in life, could exercise its hunting prowess and psychic abilities in the afterlife too. An alternative explanation is that it could have been a way of warding off the witch’s familiars, who might creep around on errands intending to cause harm. 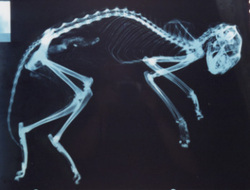 X-ray of the cat from the Red Cat Hotel, Norfolk. These cats obviously weren't dried when they were concealed and it strikes me that this would have been a fairly significant act on the concealer's behalf. Clearly there was some strong notion that concealing the animal would serve a purpose, which was almost certainly some kind of protective magic - whether as a 'foundation sacrifice' or as a form of pre-emptive counter-magic. With more examples on record their precise meaning may become clearer.